After my not-so-good experience with Kickbrix energy chews, I was sent a sample of Buzz Bite Mint Chocolate Energy Chews. Since I love everything chocolate, I was excited to try these because they contained not only chocolate, but also mint. Combine that with some good old caffeine, and I was ready to go. 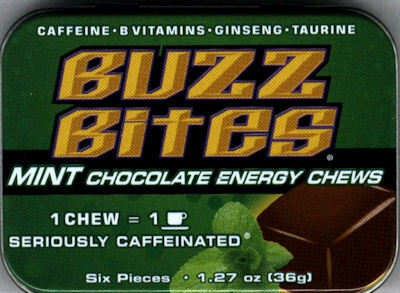 I decided to try the Buzz Bite Mint Chocolate Energy Chews on a morning where I had not gotten much sleep the night before. Since buying a Nintendo DS, I haven’t gotten much sleep on the days I have to get up for work. On the morning in question, I crawled out of bed, showered, brushed my teeth and got dressed. As soon as I walked into the kitchen, I noticed the nice green tin can that contained the energy chews. First of all, I like the packaging. Anything that comes in a cute little tin is all right in my book. That way, the energy chews are easily contained inside their tin and not spilling out all over the place in my purse. I discovered that while opening a chew, they came off easily from the wrapper, whereas the previously mentioned energy chews kind of stuck to the wrapper and were hard to pry loose. Not the case with these. They look like a chocolate version of a Starburst but were much chewier and easy on the teeth. I definitely tasted the chocolate, and while there was a little of the bitterness of the caffeine in it, the chocolate flavor kind of drowned that out. Definitely edible as an energy chew. As for the aftertaste, there was a slight mint flavor, but no lingering aftereffects. As for giving me energy, it seemed to boost my work productivity that day. I’m kind of a lazy worker, and lose energy early in the day, so these chews seemed to provide me with the extra energy that I needed to get through the day. I even think these mints were responsible for keeping me up all afternoon, thereby eliminating my four-hour nap that I take in the middle of the day. Hmmm… I think I might definitely use these again. Who needs a nap, right? I have always loved the taste of this one. the combination of mint and chocolate really makes a difference. I too know the pain of staying up too late playing video games and being unable to work the next day, so I’ll have to keep a look out for these. The combination of mint and chocolate make it awesome! haha that would be sooooo helpful in life!!!!!!!! that equals 1 cup of coffe! gosh thats CRAZY!!!!!!!!!! !